1. At the 45th reunion, Ken Van Assenderp suggested that we come up with some grand ideas to make the 50th unique. An example he gave was that we set up a scholarship fund in the name of the class. 2. In reaction to #1, several people suggested we instead do things for ourselves, like go on a cruise. 3. Here's one from Hoffman: I don't know about everyone else, but I haven't been back inside the high school since graduation night. I'd really enjoy having one of our activities in the school. Either the auditorium (if it's still there) or the cafeteria (if it's still there). Maybe we could sit around the juke box (if it's still there) and sing along with "Big John" (if it's still there) like the old days ... hahaha. And maybe for that activity, we could invite whatever teachers remain from 1959 (if there are any). 4. An Add-on to #3 from Gloria Hancock Maddox: I was also thinking about a trip back to the school and maybe have a theme like, Back to the 50's for the 50th. Also, maybe door prizes, maybe Leon High red and white shirts with a logo on them...something we can take with us; decorations with red and white balloons; a DJ with 50's music...we were there when all the 50's excitement started, etc. 5. Another Add-on from Gloria: We really have to make the 50th, the absolute greatest..trivia may also be fun...who was the 1959 May Queen and King; who was the 1959 Homecoming Queen, etc...just more thoughts...also, does anybody have a picture of "Shorty's", you know that little bar that had a dance floor on the way to Alligator Point? I tried to find one on-line, but couldn't. I did print out a lot of old photos of Tallahassee, the Florida Theater, the State Theater, Bennett's Drugstore, etc. some post card type photos of Wilson's Beach Cottages...Spring Holidays...they were the greatest...I printed out photos of the 1959 May Court. 7. Yet another from Hoffman: I stand corrected! Mary Rogers Brown tells us that Roger Fernandez is alive and well and living in Spain. Sorry about putting him in the deceased list, I really thought I had heard that back in high school. The related 50th idea is -- how about finding Roger in Spain and see if he'll invite the whole class to his home for the reunion? 8. From Judy Mimms Lange: For our 50th reunion, I agree completely with ideas about one of our events being held at the school with a theme involving the 50s, red and white, something tangible to bring home with us, etc. Also, wonder if we could get enough members of the band together (even if it sounds awful...we weren't all that great back then anyway!) to give a short performance. Don't even know where my clarinet is anymore...doubt if it's in any condition to play anyway. Maybe there are a few members who still have instruments and have kept up with playing them? There is a good DJ in town (I think he's still in business) who I know personally -- Jon Summers -- he used to date one of my daughters. Maybe I can get in touch with him. He used to have a great collection of '50s music and probably still does. If not, my oldest son, Scott, is putting his wife's nephew into the DJ business in St. Pete and we may be able to get Doug to come up...know he would do a bang up job for us. They are using professional dancers as "show stoppers" 15 minutes out of each hour to demonstrate the latest dances...wonder if they could learn the '50s dances and refresh our senior memories? That would be fun. Should be able to get either one of them at a decent price. 9. And Hoffman again: How about all attendees get a T-shirt, with the front saying "I Survived My 50th High School Reunion" and the back having something that looks like a Leon High football jersey with number 59? 10. From Dee McKinnie Keck: If we wanted to have a dance, what about a sock-hop in the gym? They were fun in the 50s, maybe would still be in the 00s. I think I still have some white socks somewhere ... (from Hoffman: Dee followed up with "I bet no one remembers much about those dances or wants to for that matter." haha ... envision a room-full of 68-year-olds sock-hopping -- I wonder how many of us will still remember how to dance by then). not get a senior class trip, that we take one. I think, however, that would be very hard to accomplish and to get adequate participation in. 12. In an email to Judy Thompson Goodwin, I (Hoffman) said : "Has anyone thought about having a joint reunion with other classes, like maybe the class of 1958 or 1960? I know we all had friends a year ahead or behind and it might be interesting to try to find out what they're planning in the way of reunions." Her response : "We have talked about having joint reunions before because of having so many married couples from different Leon years & because we were extra close to the classes before us & after us. We just never could get the energy up to pursue that. With our next reunion being the 50th, many of us might not want to share it, but that is certainly something to put before the committee." Opinions? 13. Suggestion from Carol Van Aken Oppel: I'd like to suggest to our wonderful reunion planning committee that we have nametags with names in LARGE print (first name above, then the rest of the name below, including the maiden name of the women), with a LARGE photo of the person taken from the senior pages of the yearbook. This would be a great help with the process of mentally sifting back through the layers of 50 years, to reconnect with names and faces. 14. Suggestion from Alma Claire ( Essig) Traynor. Our Leon Reunion sounds great. Thought I'd let you know that my 37 year old son, Randy Traynor is also a DJ living here in Tallahassee, if you need one for music. In fact, he did the Leon 1956 Alumni Reunion a few weeks ago (April 2006) at the American Legion Home. Said theirs was real neat! Check out his web site Sunsetsounds.net. He started when he was 14 years old, working under John Summers during his high school years. He has the lights, smoke and all the works. If you are interested, keep in mind that he books a year in advance. 15. 03/21/2007: Just received a great idea from Gene Goodwin: I have a suggestion for the 50th's planning committee. There are, no doubt, many like myself who have not returned to Tallahassee in many years. Why not offer an optional bus tour of our old "stomping grounds" (i.e., City of Tallahassee, former elementary schools, former homes of class members, landmarks, and other points of interest in Leon County)? The bus tour could be conducted on Saturday a.m. starting and finishing at Leon High and lasting no longer than 2 hrs. Charge an additional fee of $25 or so to cover the cost of a bus and light refreshments. Reservations would be made in advance and participants would submit in advance a short list of there former home addresses and other points of interest like there former churches and schools. The bus tour subcommittee would be responsible for assembling the data submitted and planning the routes to be traveled in the 2 hr. tour. A class of '59 member who resides in Tallahassee could be designated as the tour leader and would narrate over the bus microphone. I have seen this bus tour accomplished very successfully at another class reunion in a different state. I believe this bus tour might be so popular that 2 buses would be required. I would be willing to serve on a bus tour planning committe for our 50th but not as the chairman. What do you think of this idea? 16. 03/22/2007: Yet another idea - this one from Patricia Ward Sabia: Because I haven't lived in Tallahassee for many years, I would love to hear from classmates about their life since graduation. I know something similar was done for the 25th or 30th but it would be nice to have each person submit a brief synopsis, maybe some adventures, etc., of their life since graduation and have it read. This would require someone either collecting these ahead of time or having someone at a table to collect them. Hoffman Add-on: Being the internet nerd that I am, my suggestion on this would be to put the biographies online, on our website, to make them accessible anytime. They could be printed and distributed at each reunion, if desired. I've done something like this for my cousin at http://www.LittleFalls1965.com/, but we charge classmates $10 for lifetime access to the site. This was done because setting something like this up is more than a "spare-time" activity and that $10 helps on some of the costs. If you'd like to see how the Bios are shown on their site, email me and I'll set up a temporary "back-door" to the site for you. Ha-ha! I left the above example open for a couple of weeks and only got one reply agreeing to pay the $10 if we got enough support - thanks, Judy! So, I guess I'll forget about that $10 idea. What I can do is put a form on the website for classmates to fill out, then we can print these or whatever. I'll do that when I have time and email an announcement out. It's reunion time again at Leon High School. The Leon High School Class of 1957 will have its 50th reunion this weekend. The reunion will kick off Friday at Paradise Grill, formerly Mutt n' Jeff's Drive In Restaurant. Carol Ann Boydston said the restaurant is going to set aside a place for the class so members can eat slaw dogs and cherry cokes like when they were in school. If you want to contact Barbara to talk about golfing, contact me and I'll send you her email address. More ideas -- Waiting for you to speak up! I'll keep adding my thoughts .. hope you all will do the same. My email is still rjhoffman@yahoo.com. Below (scroll down) are some ideas suggested for activities that would be neato (or cool?) for our reunion. If you have any, Email them to rjhoffman@yahoo.com and I'll put them here with or without your name attached, as you prefer. August 2005: If you're from the class of '59, take the web poll on the right. Nothing binding, just to give the committee some opinions. 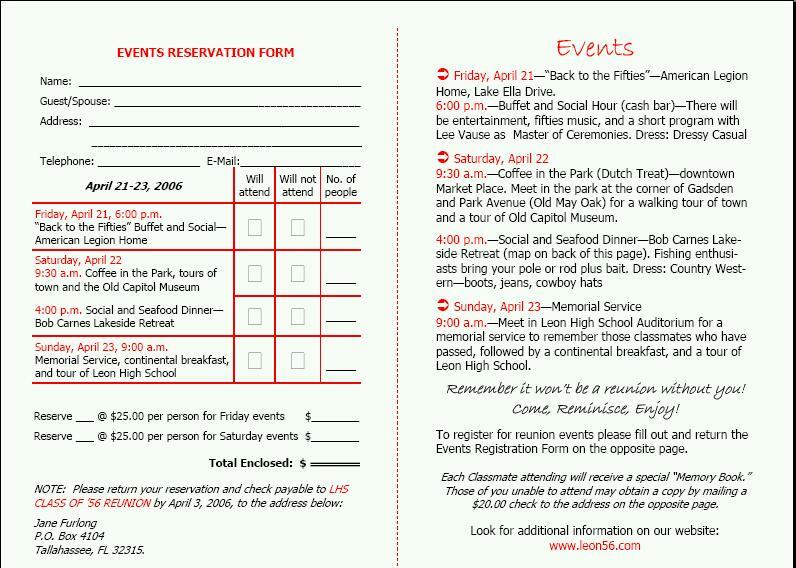 April 2006: FYI - Below is the announcement for the 50th Reunion for Leon Class of 1956. Some of their activities sound like what we're looking for, based on the poll results on the right. April 2007: Added suggestions 13-16 to the poll. Vote for more if you want to, but please don't muddy the waters by voting for the same one multiple times - this ain't American Idol!